In London yesterday evening, I approached Parliament Square along the cycleway at Great George Street. In front of me was perhaps the classic stereotypical scene shared by taxi drivers, and other people hostile to new cycling infrastructure in London (and other British towns and cities). A large expanse of empty tarmac loomed in front of me, contrasting starkly with the clogged road on the right. You might say the cycleway is ‘causing’ congestion and pollution, if you were so inclined. In the distance – on the ’empty’ tarmac – two cyclists (maybe three? who cares, really) are waiting at a red signal. On the right, frustrated drivers are needlessly spewing out fumes, and doubtless fuming themselves, at the waste of space on their left. Valuable space that – if it were used properly for important motor traffic, not for some silly hobby – would have sped them to their destination about half an hour ago. Surely, a superficial observer might think, it would make a great deal of sense to ‘free up’ that tarmac, using it to move all those motor vehicles more efficiently. It’s just obvious, surely? The cycling infrastructure is just a waste of space. But of course things aren’t that simple. How many people are actually waiting at the lights on bikes? It doesn’t look like many, but it turns out that when you get close there are… five. All tucked together in a small amount of space. How about that queue of cars and taxis? How many people are waiting there? Must be loads, surely? Well, one of the taxis in the queue – the white one, three from the front – is carrying… nobody at all. The taxi at the front of the queue, waiting to enter Parliament Square is also carrying… nobody at all. There are more people being moved somewhere on the cycleway (five), than on the road (four). I think this is an extremely common way of misreading traffic flow, and hence misdiagnosing problems. Even I felt instinctively uneasy at what appeared to be a very long queue of motor traffic, apparently being ‘held up’ for the benefit of ‘just a few’ cyclists. It was only when I found out how many people cycling were actually waiting at the lights, and closely examined how many people were actually in the motor vehicles, that I got a objective answer that directly contradicted my instinctive impression. It’s such an easy mistake to make. Motor traffic seems big, and important. All the noise, the size of the vehicles, the (occasional) speed – it seems like it’s conveying lots of people, and fast. But in reality it’s an extremely inefficient way of moving people around urban areas. Cars take up lots of space, and clog up roads, precisely because of this intrinsic inefficiency. It’s also why photographs are a very poor way of attempting to demonstrate that cycling infrastructure is pointless – it rarely manages to capture the genuine volumes of people being moved on it, relative to the road. What really matters are actual figures on flow, not photographs that are all to easy to misinterpret (or indeed photographs that are used to mislead). Private motor traffic is the real waste of space. Not cycling infrastructure. To repeat the ‘experiment’ of the first junction, I also stopped at the next two junctions at CS3, and counted vehicle occupants. Here’s ~20 people on the left, versus five on the right. Great Post. Send it to Lord Winston and his other cronies in the House of Lords. Agreed, very well put. It’s a shame most traffic models (and people…..) seem to think the measure of a roads efficiency is how many vehicles it can move instead of how many people it can move. Sure I saw stats before that showed, for equivalent single lane sized section of road, you could move either 2K cars or 14K cyclists/hr 🙂 Often what is shown as “empty” cycle lanes is just efficient as the cyclists CAN get to the lights at far end unhindered, unlike those in the “busy” road next to it who by the time 10-15 people are in the lane are already extending back some 40m from the lights! In England in 2016 average car/van occupancy was 1.55, with 61% of them only carrying the driver. Apply that factor to those photos of streams of cars and you’ll find there’s only a dribble of people. If you’re bringing stats of van occupants into it, it’s null and void really. Most vans can’t take more than two passengers, but they’re not intended as passenger carrying vehicles. The fact that a van is used to move volumes of objects, volumes that could not be as easily transported on a bicycle. If you want a true comparison of data, leave out the vans. Depends on your definition of a van. A lot of vans are adapted to become private hire taxis but are still classed as vans. A balanced and insightful perspective on a common situation. Thanks, I shall remember some of this for use in future arguments. Excellent article. Maybe London should have a car sharing scheme where drivers pay higher congestion charge if not carrying more that one person? Not sure how you policy it but they have done it in San Fransisco for a long time. Good point, but EVEN IF cars/taxis were carrying more people, those modes are still more polluting, dangerous to others, unhealthy and arguably (external costs) far more economically costly. Hmm, two fully autonomous vehicles carrying 0 people? Your article is still valid, however, and is a very well made point. Should be required reading for every road engineer and legislator. I did a similar survey this morning ( 8.30 ) on Blackfriars Bridge. Pretty much similar numbers, a tailback over the bridge, 20 / 30 cyclists at the lights. Most vehicles carrying 1 person with only 6 with two or more in. Certainly more space taken up by driving people than cycling people. I think the point is that an empty taxi with the “for hire” light on is not actually making a ‘journey’ per se, at least not in the way that a normal single-occupant car is. Obviously we don’t know whether the taxi drivers are driving around aimlessly waiting to be hailed, or heading somewhere specifically (like a taxi rank at a station). I think that the argument made in the article still stands even if you count each of the taxis as a 1 – the size of the cars deceives our brain to perceive how the space is being utilised and leads to a false conclusion that it is a waste. Sorry, that should have been a response to Steve above. Superb. You could do similar with how many cyclists actually go through red lights. People in cars see it because it happens at the front on the queue. Whereas loads and loads of cars go through on red, at the back of the queue where they are not always seen. As you pointed out in your article, they’d be wrong for thinking that due to the fact that bikes are way more space-efficient than cars. But they’d also be wrong due to the process of induced demand. Because giving more space to cars induces traffic, congestion never decreases. Which I guess is fine if your goal is to increase traffic without decreasing congestion. But let’s be honest, most politicians justify building or widening roads with the argument that it will reduce congestion. And of course induced demand works in the opposite way. Take space away from cars and the increase in congestion will lead to a shift to more space efficient modes of transport. certainly the local council to me charged with roads planning in the area favour the widen road, add extra queuing space for car method to “solve” congestion, so far all theyve done by adding more lanes is increase the congestion and move the bottleneck to the next pinchpoint. Sadly their latest plan to add another lane to a road, consequently removes a set of on-road cycle lanes to make the space they need,and which whilst not the best infra, is certainly preferable to the shared pavement space they intend replacing it with, and its just so they can pretend theyve cut the queue lengths because the initial volume of traffic takes up less length of road. Every traffic jam is caused by more vehicles arriving at a point than leaving. The traffic queue then occupies the space required to “store” the vehicles yet to reach the bottleneck. The true way to measure traffic efficiency is to measure the number of people leaving the bottleneck. The space required to “store” the vehicles waiting to reach the key traffic point should be designed accordingly. Therefore, when the lights changed, how many cyclists and how many vehicles went through? That is the true comparison. Surprising and obvious at the same time. Thank you for putting this thoughtful article together. I am sure that many of us will point those that blame congestion on cycle lanes to this for a bit of reflection. That’s because most cyclists commuting less than a 10mile journey, a journey that in most cases could be made by public transport (buses have their own lanes and are n efficient way of moving large volumes of people, trains work much the same way), Many cyclists are just old public transport users who have decided to cycle to work (for many justified reasons, money saving, exercise, etc) but in doing so are actually adding to ‘bodies’ on the road. Aside from the taxis and vans on the road, many private car users are driving because their journey is too far to travel on public transport or bicycle, especially for people that require special equipment for their jobs, equipment that cants be easily transported on public transport or at all on a bike. 50% of all car trips are less than 3 miles, 69 % under 5 miles. But those stats don’t address the reason for the journey, are these people using their vehicles because they simply don’t want to travel on public transport, or is it not practical for them to do so?! Everyone I know that uses their car to commute into the city, either live far enough outside to justify it, or can’t do so because of the equipment they need to bring for work. People who don’t have a fixed location of work, like office workers, can’t rely on bicycles, plus not enough businesses have shower facilities for staff. I’m lucky, as I can cycle to a branch of my gym and shower there, but some don’t have that luxury. While I don’t support the idea of downright prohibiting people from using a specific mode of transport, there still remains the issues of living in a finite environment and increasingly lack of physical activity. Both of these can cause societal-level problems that can affect everyone, not to mention other indirect consequences that can degrade quality of life for others (pollution, noise, risks to vulnerable users). Thus far, the Dutch have chosen to use mostly soft measures to encourage other modes of transport. Other than the occasional exclusion from some town centers and limited access on many neighborhood roads, there aren’t that many restrictions to discourage people from driving here. The great transit network and infrastructure for cyclists may certainly make those options more attractive relative to driving, compared to other nations, but there is hardly a war on cars even in the Netherlands. As you say, there are certainly exceptional cases where only the car is feasible, but the bigger issue is that most people are inherently lazy and prefer the path of least effort. As I now live in the Netherlands, the same applies here even when there are many other convenient options available. Most of my Dutch colleagues who drive to work aren’t doing it because they have no alternatives (they all have the option with the train, bus, bike, or some combination of all three) or because they have too much to carry with them. With a decent sized pannier and even a front crate, most people can cover the vast majority of their needs with just a Dutch bike. Some families even have a cargo bike to substitute for the car within cities. But yet, the number of cars continue to increase so much so that the Dutch now own more cars per capita than the British. The number of scooters and ebikes also continue to increase rapidly, since they offer almost all the same conveniences of the bicycle but without/with much less effort involved. At some point, the soft measures alone won’t be enough to address space issues in cities and towns. They may need to build more parking and widen roads in the cities, which is exactly what they have been trying to reverse course on since the 60’s and 70’s. Oh, no doubt a large proportion of those private motorists would claim that their motoring is ‘vital’ or that it’s ‘impossible’ to make their journey by any other means. For a few of them, it will be true. But still a bit irrelevant, as nobody is suggesting that only the unvirtuous ones are the ‘waste of space’. I’m even luckier than you: I cycle slowly enough that another shower would be completely silly—even for a ≥25 km commute, how much faster would I have to be going to make up for the time it would take to have one? As it happens, I’ve always worked in ‘fixed locations’, albeit none yet with the luxury(?) of having shower facilities. But I still get there quicker than motoring in urban areas, of course, by dint of cycling being so much more space efficient. A good example from the UK that shows how good cycling infrastructure can improve traffic congestion, even though it may not look like it. Brilliant, love the phrase about cars seeming big and important, so they draw the eye more. You don’t notice the single person inside. Also, empty cycle lanes in busy towns are evidence that they WORK. the purpose of a road isn’t to store traffic, it’s to MOVE traffic. Holding cars stationary is STOCK, the movement of cars is FLOW. Same with bikes, an empty bike lane shows that bikes are flowing, and the road is doing what it is supposed to. The reason you don’t see traffic jams of stationary bikes is they flow very well indeed, as a previous commenter says, they clear bottlenecks very well indeed compared with cars. An empty bike lane is actually a SUCCESSFUL bike lane. Excellent article everyone needs to share this when that frustrated car user friend tries to argue their point about cycle lanes. Well done. Reblogged this on Cycle Bath. Agreed, and what about all the speed bumps they’ve built in the cycle lanes along embankment. I’d rather cycle in the roadway there for the sake of riding comfort! Which then kinda defeats the object of them being built in the first place! It’s amazing what some drivers are willing to drive into! Also, do a search on that blog for ‘armadillos’ and you’ll find a number of other bits of solid plastic, bolted into the carriageway never mind Hilti’d, which drivers have studiously ignored. At the present stage in the UK the priority is to get a coherent network as fast as possible possibly on an experimental basis. I have seen linked concrete blocks being used effectively. What experiments? There are no experiments needed, just a very speedy conversions of the streets in Britain on the Dutch model. 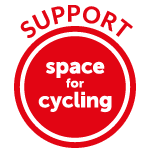 The objections to the cycling infrastructure also make the assumption that if it were removed the cyclist people would either just disappear or join the overall space with no effect on the car traffic. In fact many cyclists in a cycling unfriendly situation would take to cars themselves. Even if they were accommodated in the shared road space they would have an effect on vehicle movement. I use my tricycle regularly on these routes a I never want to go back to driving a car in London. And of course, this is even with a pretty pathetic grid network to link up with the cycleway, limited numbers of cycle tracks on the distributor roads that need it as well but don’t at the moment, with large campaigns scaring people like the high viz and helmets, with pre-existing parental attitudes discouraging the use of bicycles to get to the destinations a child might need to go on anything but the quietest of streets, bad signal design and overly long waiting times at traffic lights, etc. Perhaps these ’empty’ cycle lanes should be photoshopped so that the same photo shows every cyclist in them replaced by a passenger vehicle. That would give a good idea about empty lanes. Or even better, a video. People will have no clue about their efficiency until it’s made reallllly obvious. It’s similar to the way in elections you’ll get colour-coded maps showing the relative votes that show the geographical areas of constituencies (or whatever the US equivalent is called), rather than the number of people, thus massively over-emphasising the votes of rural low-population-density areas. Is there a name for the general fallacy of counting physical space rather than people?